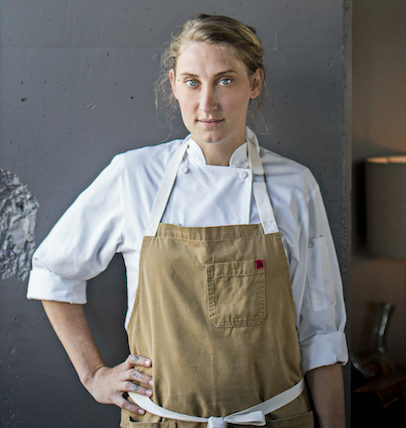 In addition to being a 2017 Chef Summit Scholar, Ashley joined chef Steven Satterfield as Co-leader of the Atlanta Local Group at the end of 2017. What drives your passion for sustainable cooking? Approachability is what drives my passion for sustainable cooking. The idea that we can teach the public such valuable lessons about doing your due diligence to leave behind a small footprint, and that good sustainable food sources are available to them right here in their own community. I believe that the idea of sustainability does not end in my restaurant’s kitchen, and should be transferred to the people that I feed, by doing my part to educate everyone that I can. What do you love about the Atlanta local food community? Most certainly the overwhelming feeling of family, friendship and fellowship. We all care so deeply about our craft and will go out of our way to help another in need without a second thought. It’s very comforting to know that I have such a welcoming group of open arms to rely on. Why did you become a Member of Chefs Collaborative? I became a Member of Chefs Collaborative because I wanted to be a part of something that is greater than myself; I want to be more than just a chef in a restaurant. I believe that Chefs Collaborative can help me achieve that. What’s a future project you’re excited about? My restaurant is currently getting involved with a local composting company to help us reduce our food waste and bring awareness to the issue! Waste not, want not. How do you help to change menus in order to change lives? I help to #ChangeMenusChangeLives by always doing my best to source locally in order to support my community, by continually making an effort to reduce my food waste, and by taking the time to meet my guests and tell them a little about what we are doing and how important it is to our future. I wholeheartedly believe that we can enact a larger wave of change if everyone has the same goal in mind! What did you learn about “Growing Community and Owning the Future” at Chefs Collaborative’s 8th Annual Summit in Atlanta this past September? The Summit was such an eye-opening and emotional experience for me because it was the first time that I realized just how devoted and generous this wonderful community of like-minded individuals really are. The issues we face in this industry can oftentimes feel so overwhelming and discouraging, yet among these individuals, these new brothers and sisters in restaurants across the country, I felt a new sense of courage and hope. It almost felt like being adopted by a new family. We CAN change the future, and it all begins right here in our little communities, hand in hand, united in our passions to make a difference.